There’s this wonderful first assistant and he’ll be saying, ‘Now Harry goes down among the dragons.’ You have to hold yourself together. Because if you lose it for a second then you’re sunk. I said ‘It can’t go on’ and he said ‘No, it can’t.’ Honestly, I don’t think I could have mattered less to him by then. But by then, nothing mattered to him. I had been feeling a little rum. I didn’t think it was anything serious because years ago I felt a lump and it was benign. I assumed this would be too. It kind of takes the wind out of your sails, and I don’t know what the future holds, if anything. When you get into the granny era, you’re lucky to get anything. There is a kind of invisible thread between the actor and the audience, and when it’s there it’s stunning, and there is nothing to match that. The last couple of years have been a write-off, though I’m beginning to feel like a person now. My energy is coming back. I like being outside and working with the elements. The elemental aspects of it. The physicality of it. I know there is something out there and like most people, I tend to believe in it more when things go bad. I don’t think films about elderly people have been made very much. It seems to me there is a change in what audiences want to see. I can only hope that’s correct, because there’s an awful lot of people of my age around now and we outnumber the others. It’s true I don’t tolerate fools but then they don’t tolerate me, so I am spiky. Maybe that’s why I’m quite good at playing spiky elderly ladies. The chemotherapy was very peculiar, something that makes you feel much worse than the cancer itself, a very nasty thing. I used to go to treatment on my own, and nearly everybody else was with somebody. I wouldn’t have liked that. Why would you want to make anybody sit in those places? People think of you differently if you’ve been in their homes. They think they own you because they watched you while they were eating dinner, or they can turn you up or down, or even freeze you. I tend to head for what’s amusing because a lot of things aren’t happy. But usually you can find a funny side to practically anything. 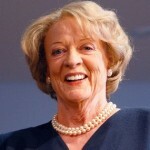 Maggie Smith is an English actress. She made her stage debut in 1952 and has had an extensive, varied career in stage, film and television spanning over sixty years. Smith has appeared in over 50 films and is one of Britain's most recognisable actresses. In 1990, she was made a Dame for services to the performing arts by Queen Elizabeth II.